CHICAGO (WLS) -- An Elgin man was convicted in the brutal murder of his new neighbor after she caught him burglarizing her home in 2013. He could face up to 100 years in prison. 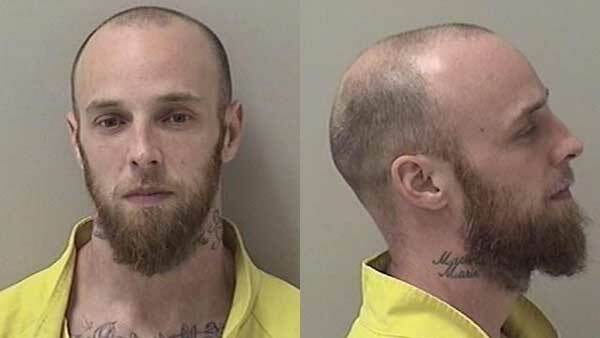 A jury found Paul A. Johnson, 36, guilty of first-degree murder in the fatal stabbing of Lisa Koziol-Ellis, 33, the Kane County state's attorney's office said. Prosecutors said Johnson broke into Koziol-Ellis' townhouse in the 1-99-block of Garden Crescent Court in Elgin sometime between 11:30 p.m. on March 1, 2013 and 1 a.m. on March 2, 2013. They said he thought he was there alone. When he found Koziol-Ellis inside the house, prosecutors said he stabbed her 55 times in the head, neck, torso and arms. Thirteen of the wounds were defensive and consistent with being stabbed by a knife or screwdriver. Her husband found her body when he got home from work around 2:30 a.m. on March 2, 2013. Friends described her as a warm-hearted jewelry artist who loved tattoos. Johnson was charged in Koziol-Ellis' murder on March 17, 2013. He was on parole for a 2010 residential burglary conviction at the time of the murder. He was previously convicted for armed robbery twice in 2001, the state's attorney's office said. He could face between 20 and 100 years in prison, since the jury also found he exhibited "exceptionally brutal or heinous behavior indicative of wanton cruelty." Johnson is due back in court for sentencing on Aug. 10. He is being held at Kane County Jail.